Apple templates for 3d flash book shows you groups of 3d page flip book templates that related to apples. Are you growers of apples and happy to see harvest after a year hard work? Are you apples maker who produce huge delicious apple snacks like apple pie? Do you all want to push out your apples brand through internet? 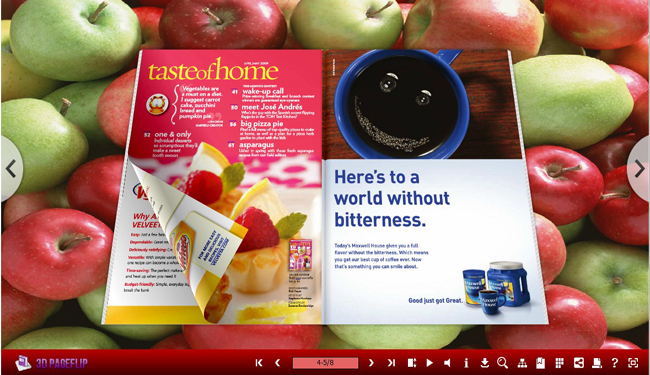 Here a 3d page flip book can help you create your own digital brochures for apple industry. What s more, you can use these templates for your 3d flash book to make it more perfect. Download url: http://3dpageflip. Com/themes/2012/download/apples. Zip 1. Start 3d pageflip program, design 'page layout', set logo file, logo link, base color, tilt angle, background config and so on, click 'apply change'; 2. Click 3d book icon and then choose 'export current settings as themes', define output folder and theme name to save directly; 3. Apple Templates for 3D Flash Book is an utility that works under windows xp, windows vista and windows 7. It supports both 32-bit & 64-bit windows editions, therefore it could run faster on 64-bit computers. It is Free so you can download it and share it with your friends. Estimated download time for Apple Templates for 3D Flash Book on a common adsl connection is less than a minute. Version 1.0 was released two thousand four hundred thirty three days ago by 3D PageFlip Ltd.. Click the green download button to download it now.